I’ve wanted to include this for a long while, and the day of the Queen’s 2012 visit to York seems appropriate. 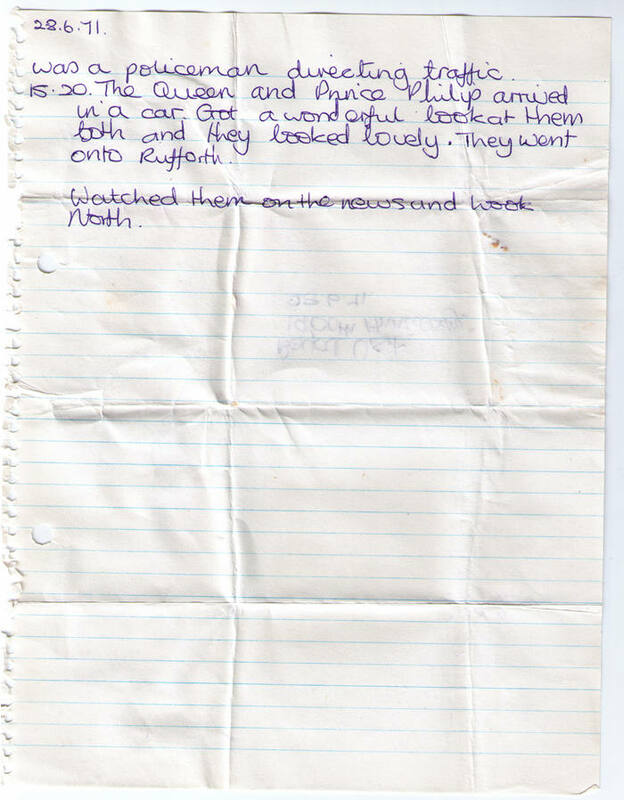 Sadly I don’t remember the 1971 visit, even though I was apparently taken to see the royal couple pass by the end of Beckfield Lane, as they departed York via Rufforth. 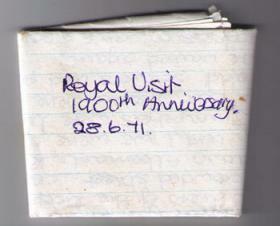 The images of the handwritten pages can be enlarged, if you’d rather read the original ‘historic document’. 7.30 – I got up, had a drink of tea and got dressed. I polished my shoes and then hung around until it was time to go to meet Jacky. I was wearing my turquoise skirt and shetland wool jumper, tights and black shoes. 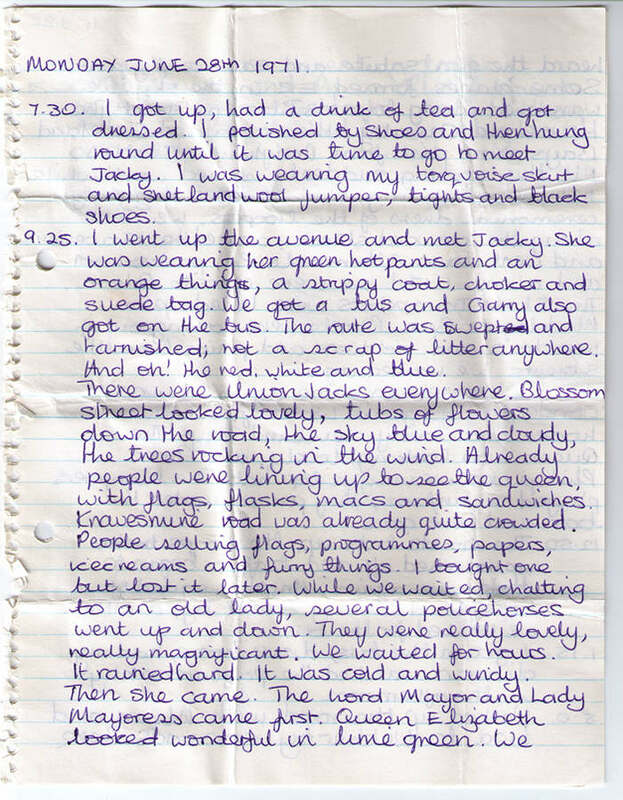 9.25am – I went up the avenue and met Jacky. She was wearing her green hot pants and an orange thing, a stripey coat, choker and suede bag. We got a bus and Garry also got on the bus. The route was swept, not a scrap of litter anywhere. And oh! the red, white and blue. There were Union Jacks everywhere. Blossom Street looked lovely, tubs of flowers down the road, the sky blue and cloudy, the trees rocking in the wind. Already people were lining up to see the Queen, with flags, flasks, macs and sandwiches. Knavesmire Road was already quite crowded. People selling flags, programmes, papers, ice creams and furry things. I bought one but lost it later. While we waited, chatting to an old lady, several policehorses went up and down. They were really lovely, really magnificent. We waited for hours. It rained hard. It was cold and windy. Then she came. The Lord Mayor and Lady Mayoress came first. Queen Elizabeth looked wonderful in lime green. We heard the gun salute and saw a fly past. Some ‘planes formed ER in the sky. We wandered along towards Blossom Street. The Household Cavalry, the coach and Cleveland Bays came past from Dringhouses Stables. All this waiting suddenly seemed worthwhile. All the gleaming black horses, dazzling ceremonial dress of the troopers. We went along the crowded street, crossed the Knavesmire and went down Albermarle Rd, past school and along until we were opposite Odeon. The State Trumpeters were lined up on Micklegate Bar. People were looking out of windows and soldiers and police lined the streets. We waited again. Then the procession came again. It was gorgeous. Wonderful black horses and Cleveland Bays. The queen was looking lovely, and Prince Philip was wearing a top hat. The trumpeters played a fanfare, they passed under the bar and were gone. 12.50 – The crowds broke up, the troops marched off and traffic began to move again. Another squad of Household Cavalry came by, and then we waited for the bus. 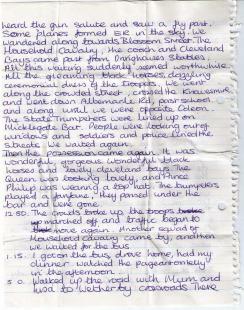 1.15 – I got on the bus, drove home, had my dinner, watched the pageant on telly in the afternoon. 5.00 – Walked with Mum and Lisa to Wetherby crossroads. There was a policeman directing traffic. The Queen and Prince Philip arrived in a car. Got a wonderful look at them both and they looked lovely. They went on to Rufforth. Watched them on the news and ‘Look North’. I stalled in including this account, because although copyright is mine (© www.yorkstories.co.uk, in this case) and I don’t have to ask permission, I would have liked to check. Sadly I can’t as Kay died in 2001. 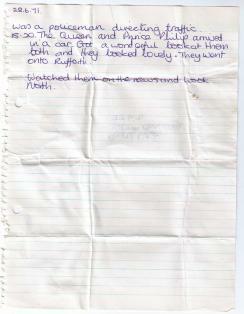 We did once discuss our ‘embarrassing teenage diaries’ and how we’d leave them to one another. 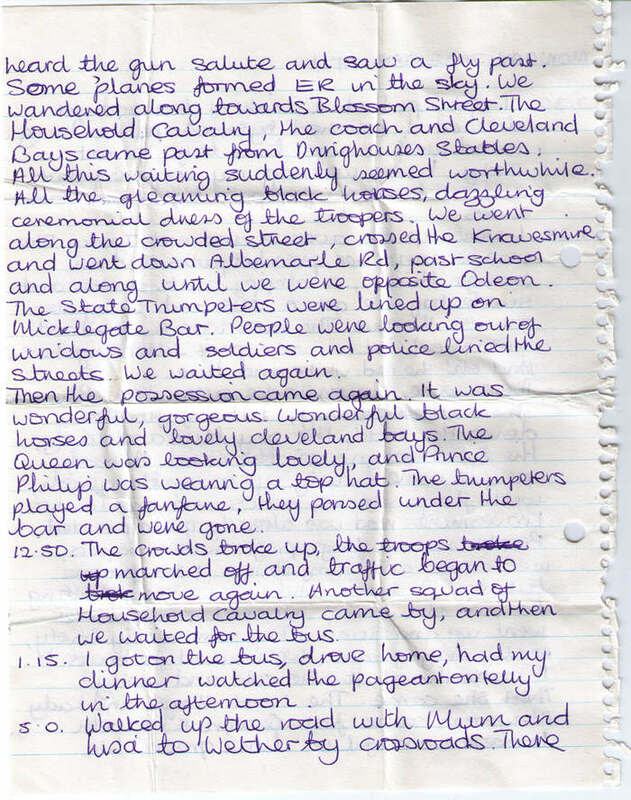 This document she may have found particularly embarrassing, as the adult Kay wasn’t such a fan of the monarchy, as I recall. Having shared them with you, I’ve folded up these two sheets of paper back into a small square, as they were before, and returned them to the 1971 diary. Which, of course, is marked ‘PRIVATE – Do Not Touch’. Sorry Kay, hope you wouldn’t have minded. 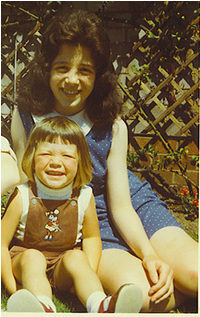 That lovely piece of diary/prose,from your Sister’s pen,and obviously treasured by you,is most touching,and sensitive,the picture of you ,as youngsters,reveals the closeness you must have had. 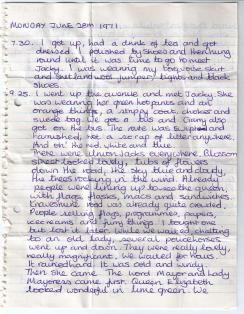 A literary ‘Golden Moment’,from two very talented people.Very,Very memorable Lisa! Thanks for your kind comments – and also for being kind enough not to mention my ridiculously short fringe – one of those ’she’s too young to realise how silly this looks’ fringes.